One word of caution before we get to the recipe: As tempting as it may be to add more zucchini to the recipe if you have extra, I can tell you from experience that it will not end well. So, even if you have extra zucchini and you don’t want to waste it, please don’t add it to the batter unless you want to deal with an oven disaster! 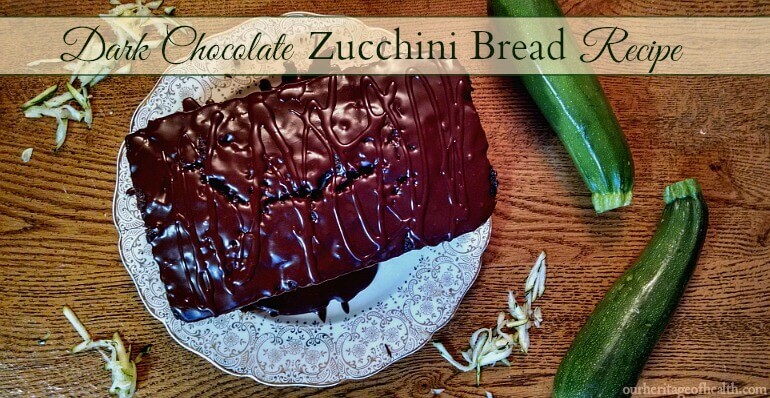 Except for that one time, though, this is a tried and true chocolate chip zucchini bread recipe that has always turned out well for me and that I make every summer, and I would definitely recommend it to any fellow chocolate lovers! In a mixing bowl, beat eggs, and then stir in the oil, sugar, grated zucchini, and the vanilla. In a separate large mixing bowl, add the flour, baking powder, baking soda, cinnamon, and salt, mixing well to combine. Add the wet mixture to the dry mixture, stirring well to combine (but being careful not to overmix either). Grease and flour a 9×5 inch loaf pan and pour bread batter into pan. Let bread cool completely and then drizzle on the dark chocolate glaze if desired. Mix together the powdered sugar and the cocoa powder until well combined. Add the vanilla and then add the water slowly one tablespoon at a time, stirring well, until the glaze reaches the right consistency for drizzling. Drizzle glaze liberally over bread and enjoy!